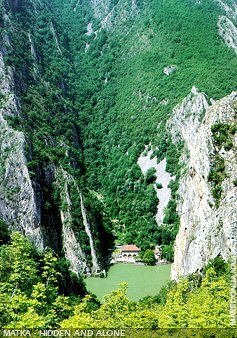 The Matka lake & canyon is located in the lower course of river Treska, 15km southwest of Skopje. 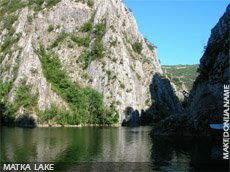 With it's geological, geomorphologic and hydrological characteristics, and the flora and fauna, Matka lake is an exceptional object of nature. The main phenomenon of this natural treasure is the canyon, a distinguished geomorphologic entity with well preserved natural and geographic characteristics in which rare and endemic species find their escape. This outstanding work of nature, with sides 1000m high and step notches of over 250m, was created by vertical erosions of the Treska river during the long geological history. The area of the canyon is characteristic by low mountains. The Osoj hill is the northwest boundary, Suva Gora mountain and Vodno occupy the southeast and the east of the canyon. The north frontier is an entrance to the Skopje valley, following the course of the villages of Matka, Šiševo, Glumovo and Saraj. Geographically, the ground consists of thick layers of over one billion years old carbonate rocks and somewhat younger slate carbonate, rocky masses. The Matka caves and abysses as special categories of late geographic forms are mainly concentrated on the right side of the canyon, under the area Visoki Rid (High Hill) on 885m attitude. There are about ten of them, but most known are: Vrelo, Krstalno and Ubava. The over ground carts forms are located in the wider area of Rudine represented by crevices, funnel-shaped depressions, hollows and small rocks-as special micro forms on the surface carts relief. In the Matka canyon, on the left side of the valley high in the rocks, there is a very interesting phenomenon of a natural bridge, created by the erosive processes in the carbonate rocks. The most interesting object is the Treska river with the Matka accumulation, offering wide opportunities for development of the tourism and recreational activities. The underground spring Koritište with water delivery of 2meters per second should be also mentioned. Besides its enormous scientific phenomenon of the carst hydrography, it s also very important as a future water supply resource for the city of Skopje. The Matka canyon is also a true oasis with various and well preserved autochthonous fauna. A great number of relic and endemic species, as well as typical examples of newly discovered animal species can be found there. The most fascinating is the exclusively great number of various kinds of butterfly species, 84 of which can be found there and nowhere else on the Balkans. A part its natural values, the Matka canyon with its immediate surroundings, is valuable treasury of our cultural heritage, presenting to us antiquities from the different time periods. Remains of many ancient and medieval settlements and fortresses and a great number of well preserved medieval churches and monasteries are discovered. Many of this discoveries are of precious value. 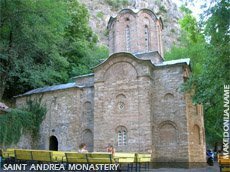 Most of them are: the monastery of St. Andrea from the 14th century, the church St. Nikola Šiševski from the 13th-14th century and the medieval town of Matka with the church St. Nedela from the 14th century and St. Bogorodica church from the 14th century.